Doesn’t time fly? It’s almost a fortnight since I joined colleagues at what has now become an annual event in the Scottish education technology calendar; the ALT Scotland one day conference. One of the things I really like about this event is that it consistently brings together colleagues from all sectors of Scottish education to discuss issues relating to open education technology, policy and practice. The theme of this year’s event was Sharing Digital Practice and Policy in Scottish Education, and it was highly appropriate that it was hosted by Glasgow Caledonian University as they have just approved their new institutional OER policy. Unfortunately I haven’t had the chance to put together a storify or write a full summary of the event, however thanks to Martin Hawksey’s fine audio visual skills you can view the entire livestream of the event on the ALT YouTube channel here: AM / PM. I do want to pick up on one of the themes that emerged from several presentations though and that is the problem of blocked pipelines and infinite loops. Marion Kelt, Senior Librarian: Digital Development and Information Literacy at GCU, was the first to raise this issue in her talk about the lengthy process of getting GCU’s Open Educational Resources policy approved by the university. At one stage this involved being referred to an institutional IPR policy that she eventually discovered did not actually exist! This is just one example the kind of infinite loop it’s very easy to get drawn into when trying to introduce new policy. Often it’s unclear which management structures within the institution have the authority to ratify new policy, particularly if that policy has evolved from the ground up. The danger is that draft documents get endlessly stuck in limbo, waiting for approval that never comes. Thankfully Marion is nothing if not persistent and after going round these loops several times she was eventually successful in getting the policy approved. GCU’s Open Educational Resources Policy, which is based on the University of Leeds‘ OER policy, can be accessed here. 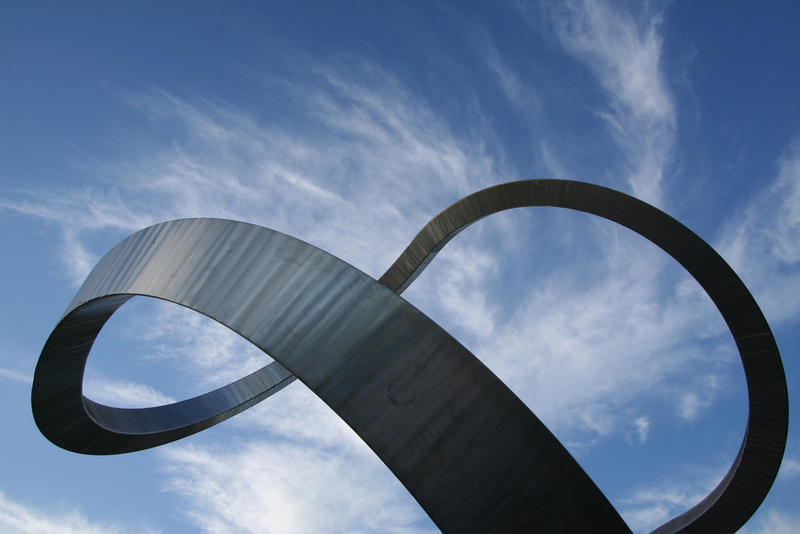 Joe Wilson, of the College Development Network, highlighted a similar infinite loop. When he was appointed as Chief Executive of CDN earlier this year, Joe made it his number one priority to encourage the FE sector to sign up to the principles of the Scottish Open Eduction Declaration, an initiative he has been involved with since its inception in 2013. Joe began by taking the relevant papers to the Committee of Regional Chairs, which is composed primarily of deputy principals of colleges. They were broadly supportive but advised taking the Declaration to the Principals’ Forum. The Principals’ Forum were also very interested and keen to do something, but they in turn suggested that it was the Government’s responsibility to take a stance on open education. Suffice to say, while there appears to be some interest in adopting open education principals and practice in the FE sector, there are still a lot of blockages in the pipeline. As Joe said “we’re still at the stage of I’m not going to show you mine unless you show me yours”. However I’m quite sure that if anyone has the vision and determination to clear these blockages, it’s Joe. 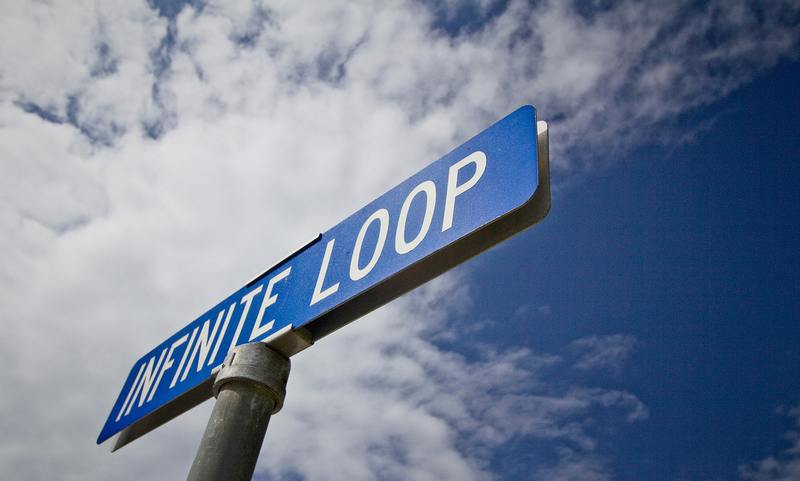 Which brings me on to my own infinite loop…Earlier this year the ALT Scotland SIG Committee brought the Scottish Open Education Declaration to the attention of Angela Constance, Cabinet Secretary for Education and Lifelong Learning. We were pleased to receive the following positive and encouraging response from the Higher Education and Learner Support Division. However Jisc’s recent announcement that it will be closing Jorum, the UK OER repository for higher and further education and the skills sector, and “refreshing” their approach to open educational resources, does rather beg question who, if anyone, is supporting open education in Scotland? I have no immediate answers as to how we break out of these infinite loops and clear the blockages in policy pipelines. Sometimes it’s a case of identifying exactly where the blockage lies, sometimes it’s more to do with identifying that one person who has both the vision, the authority and the determination to make a stand and take the decision to move things forwards. There is one blockage I have been able to clear however. During the meeting several colleagues asked how much longer the Scottish Open Education Declaration would be available only as a draft. They explained that the Declaration’s draft status was preventing them from using the document to promote open education within their own institutions as the draft status meant that senior managers were unwilling to give it serious consideration. As there have been no further comments on the Declaration since draft 0.2 was published towards the end of last year, the status of the document has now been updated from draft 0.2 to edition 1.0. Hopefully I’ll be publishing a short post on this update over at the Open Scotland blog shortly. Yesterday Jisc announced its intention to retire Jorum in September 2016 and “refresh its open educational resources offer”. I’ve been involved with Jorum, in one capacity or another, since 2002 when Moira Massey and Sarah McConnell at EDINA, started drafting a proposal for a repository as part of the Jisc eXchange for Learning Programme (X4L), and I’ve also been a member of the Jorum Steering group since it was set up in 2005 to help guide Jorum through its transition to service phase. I’ve seen Jorum develop through many iterations and technical incarnations and it’s been a long and interesting journey. There have been many stumbling blocks along the way, but we’ve seen real progress and have learned a great deal about the practicalities of education resource description, discovery and management. Both the education and technology landscapes have changed fundamentally since Jorum came into being thirteen years ago and it hasn’t always been easy for the service to adapt to those changes as quickly as the sector sometimes expected. Despite these challenges, all members of the Jorum Team, both past and present, always remained fully committed to providing a useful service to the community and have shown huge dedication to supporting their users, so I’d like to take this opportunity to publicly thank every one of them for their efforts. However there does seem to be a resurgence of interest in sharing resources in both the further and higher education sectors over the last year. HE institutions are starting to explore the potential value of developing open education policy and Glasgow Caledonian University recently became the first HEI in Scotland to approve an institutional OER policy, based incidentally on a University of Leeds policy originally created as part of the UKOER programme. GCU also plan to implement their shiny new policy through the creation of an institutional OER repository based on the University of Southampton’s EdShare platform. 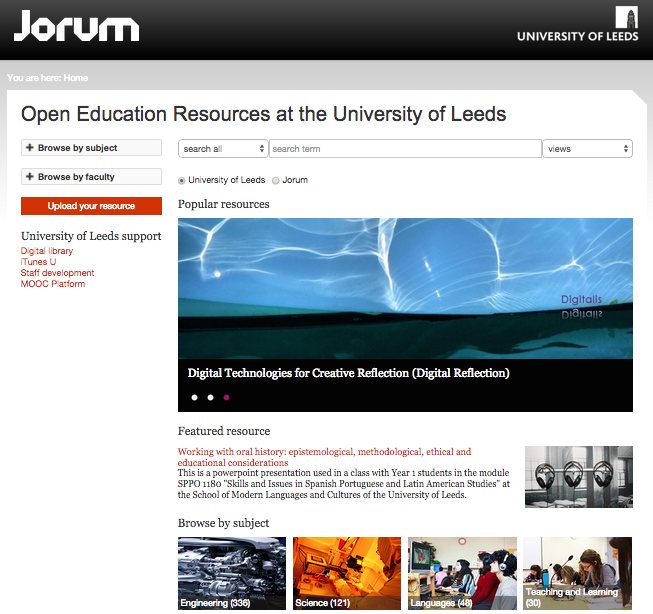 Leeds are still actively supporting the sharing and discovery of open educational resources through their institutional Jorum Window, a valuable service provided by Jorum that other institutions were beginning to explore. The University of Edinburgh also has an ambitious vision for open education and intends to develop frameworks to enable staff to publish and share their teaching and learning materials as OER in order to enrich the University and the sector. In addition, the OER Conferences, now supported by ALT, continue to go from strength to strength, despite many predicting their demise once the UKOER funding ran out. There is also increasing interest in sharing resources in the further education sector, partly as a result of the FELTAG recommendations, the full impact of which have yet to be felt. Following an ambitious programme of regionalisation in Scotland, colleges are starting to explore the potential of sharing resources within consortia. This may not be the fully open sharing that many in the sector aspire to, but its a good start. There is some way to go in the FE sector before the culture of competition transforms into a culture of cooperation and collaboration and this is where the support of organisations such as Jisc and the College Development Network is invaluable. I’m not going to comment too much on the Jisc App and Content Store yet, as it’s clearly very early days and, as with any agile development, I expect it will go through many iterations before it sees the light of day. However I will say that talk of customers and App Stores rather concerns me as it brings to mind commercial associations that sit rather uneasily with my conception of open education. There is still a huge amount of open education knowledge and expertise within Jisc, not just within the Jorum team, but also across their account managers, subject specialists and senior co-design managers, and I sincerely hope that Jisc will build on the invaluable expertise of their own staff and colleagues across the sector to ensure that their new refreshed approach to open education really does meet the changing digital demands of the Further and Higher Education community. A couple of weeks ago, along with many of my colleagues, my post with Cetis at the University of Bolton came to an end following an institutional review. I’ve been working for Cetis in one capacity or another for fourteen years (! ), since Charles Duncan and I kicked off the CETIS Educational Content SIG way back in 2001. It’s been an eventful journey to say the least, and I’ve had the pleasure of working with some amazing people along the way. So what’s next on the cards? Well, I’m delighted to say that I’ve added a new string to my bow; at the beginning of March I took up a new part-time post as Digital Education Manager with EDINA at the University of Edinburgh. I’m very lucky to be job-sharing with Nicola Osborne, who was formerly EDINA’s Social Media Officer and whose work I’ve admired for a long time. Digital Education Manager is a new post at EDINA and I know that Nicola and I are both looking forward to developing new opportunities with colleagues within the university and further afield. As I’m currently working with EDINA two days a week, I’m also available for projects and consultancy work and am looking forward to working in partnership with former Cetis colleagues and others. In particular, I’m looking out for opportunities that will allow me to remain active in the open education space, so if I can be of any assistance, please do let me know! I’ll also be continuing with many of my existing commitments to Open Scotland, the Open Policy Network, the ALT Scotland SIG, the Dublin Core Education and Outreach Committee and the Society for Nautical Research. And of course I’m also looking forward to co-chairing the OER16 Conference with Melissa Highton at the University of Edinburgh next year. I’ll be updating my blog over the next couple of weeks to reflect these changes and to provide more information about the consultancy services I’ll be providing. Onwards and upwards! Digital humanities is an area that I’ve been interested in for a long time but which I haven’t had much opportunity to engage with, so earlier this week I was really excited to be able to go along to the Digital Scholarship Day of Digital Ideas at the University of Edinburgh. In the absence of my EDINA colleague Nicola Osborne and her fabulous live blogging skills, I live tweeted the event and archived tweets, links and references in a storify here: Digital Day of Ideas 2015. I also created a TAGS archive of tweets using Martin Hawksey’s clever Twitter Archiving Google Spreadsheet. Ben explored the role of data analysis in humanities and explored the methodological and social challenges presented by humanities data analysis. He began by suggesting that in many quarters data analysis for humanities is regarded as being on a par with “poetry for physics”. Humanities data analysis can rase deep objections from some scholars, and seem inimical to the meaning of research. However there are many humanistic ways of thinking about data that are intrinsic to the tradition of humanities. Serendipity is important to humanities research and there is a fear that digital research negates this, however it’s not difficult to engineer serendipity into cultural data analysis. Capta is “taken” actively while data is assumed to be a “given” able to be recorded and observed. From this distinction, a world of differences arises. Humanistic inquiry acknowledges the situated, partial, and constitutive character of knowledge production, the recognition that knowledge is constructed, taken, not simply given as a natural representation of pre-existing fact. Anouk explored the difficulties and opportunities facing scholars of twentieth-century literature and culture that result from the impact of copyright restrictions on the digitisation of texts and artefacts. Due to these restrictions many modern and contemporary texts are out of digital reach. The LitLong project highlights gaps in modernist sources caused by copyright law. However there are cracks in the record where digital humanities can open up chinks in the data to let in light, and we can use this data as the key to open up interesting analytic possibilities. During her presentation Anouk referenced the Manifesto of Modernist Digital Humanities, situating it in reference to the Blast Manifesto, Nathan Hensley’s Big Data is Coming for Your Books, and Underwood, Long and So’s Cents and Sensibility. By way of example, Anouk demonstrated how network analysis can be used to explore biographical texts. Biographies are curated accounts of people’s lives constructed by human and social forces and aesthetic categories. 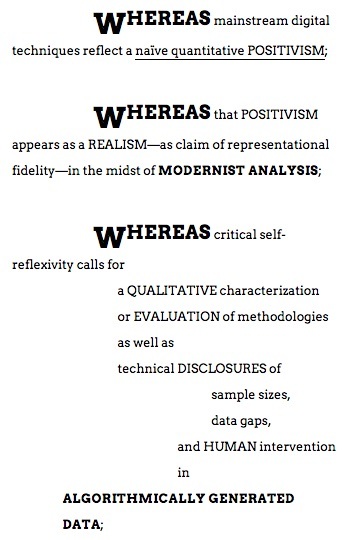 There is no such thing as raw data in digital text analysis: all the choices about data are subjective. Redrawing network maps multiple times can highlight what is durable. For example network analysis of biographical texts can reveal the gendered marginality of writers’ wives. In conclusion, Anouk argued that digital deconstruction can be regarded as a form of close reading, and questioned how we read graphical forms such as maps and network illustrations. How do network maps challenge established forms of knowledge? They force us to stand back and question what our data is and can help us to avoid the linearity of narrative. Ruth’s closing keynote explored the nature of complex networks and the use of mathematical models to explore their underlying characteristics. 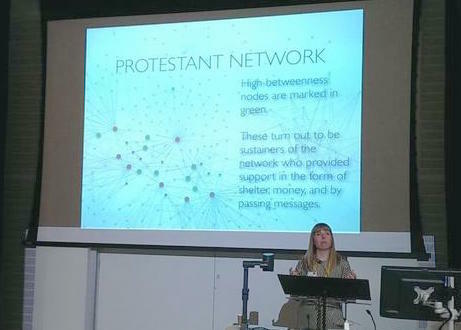 She also provided two fascinating examples of how social network analysis techniques can be used to analyse collections of early modern letters, a set of Protestant letters (1553 – 1558) and Tudor correspondence in State Papers Online, to reconstruct the movement of people, objects, and ideas. She also rather chillingly compared the Tudor court’s monitoring of conspiracies and interception of letters with the contemporary surveillance activities of the NSA. Ruth Ahnart. Picture by Kathy Simpson, @kilmunbooks. Ruth introduced the concept of betweenness* – the connectors that are central to sustaining a network. Networks are temporal, they change and evolve over time as they are put under pressure. Mary I took out identifiable hubs in the Protestant network by executing imprisoned leaders, however despite removing these hubs, the networks survived because the sustainers survived, these are the people with high betweenness. In order to fragment a network it is necessary to remove, not the hubs or edges, but the nodes with high betweenness. Ruth went on to introduce Eigenvector centrality which can be used to measure the quality of people’s connections in a network, and she explored the curious betweenness centrality of Edward Courteney, 1st Earl of Devon (1527 – 1556). Courteney’s social capital is quantifiable; he was typical of a character with high Eigenvector centrality, who cuts across social groups and aligned himself with powerful nodes. In conclusion, Ruth suggested that network analysis can be used to open archives, it doesn’t presume what you’re looking for, rather it can inspire close reading by revealing patterns previously unseen by traditional humanity research. I was certainly hugely inspired by Ruth’s presentation. 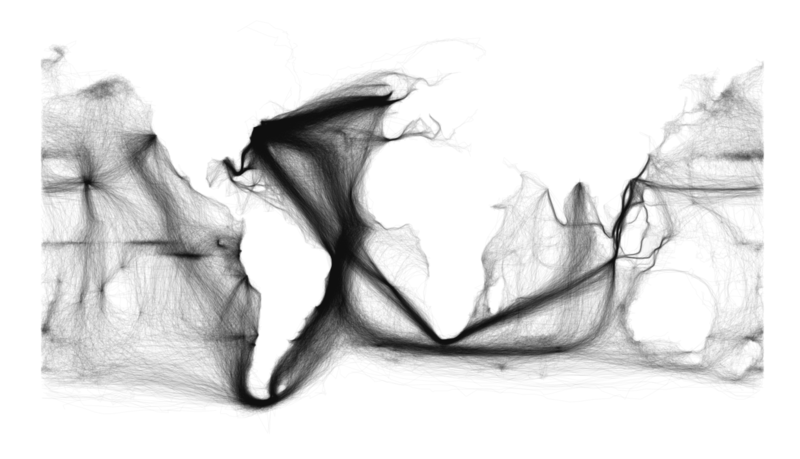 I have some passing familiarity with the concepts of network analysis and betweenness centrality from the work of Martin Hawksey and Tony Hirst however this it the first time I have seen these techniques applied to historical data and the possibilities are endlessly inspiring. One of the man aims of our Indefatigable 1797 research project is to reveal the social networks that bound together a small group of men who served on the frigate HMS Indefatigable during the French Revolutionary War. Using traditional techniques we have pieced together these connections through an analysis of ships musters, Admiralty archives, contemporary press reports, personal letters and birth, marriage and death certificates. We have already built up a picture of a complex and long-lived social network, but I now can’t help wondering whether a more nuanced picture of of that network might emerge through the application of social network analysis techniques. Definitely something to think more about in the future! Many thanks to Anouk Lang and the Digital Scholarship team for organising such a thought provoking, fun and engaging event. 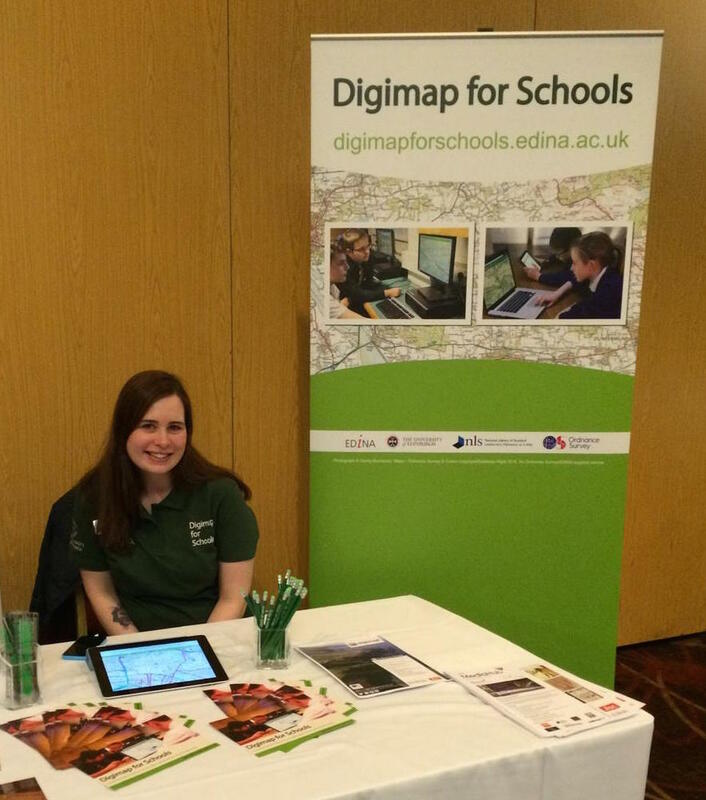 Earlier this week I attended the Holyrood Connect Learning Through Technology Conference in Glasgow as a guest of the Digimap for Schools team. It’s the first time I’ve been to this conference and I confess that I came away rather perplexed as to precisely who the event was aimed at and what we were expected to take away. I’ve created a storify of my tweets here so you can judge for yourself, and my colleague Nicola Osborne live blogged the second day of the conference here. The highlight of the event, for me, was Tim O’Shea’s engaging keynote on the University of Edinburgh‘s ambitious plans to mainstream digital education by embracing openness, expanding the provision of MOOCs and online masters, and developing open educational resources. By 2020 the university expects to have 40,000 on-campus students, 10,000 off-campus online students, hundreds of MOOCs and thousands of OERs. Hybridity and blended learning are key to these plans, with students both on and off campus engaging with online learning resources. In order to delivery this vision of mainstreaming digital education, O’Shea argued that the university needs a technology strategy that embraces applications within the institution, on the open web, and on learners own personal devices. O’Shea explained that Edinburgh’s original rational for developing MOOCs was for reputational benefit, for fun, and to experiment with new modes of teaching and learning; not to make money. The University of Edinburgh’s MOOCs embrace an eclectic range of subjects covering everything from chickens, to philosophy, to extraterrestrial life and back again, and while the majority of learners who engage with these courses are already highly educated, O’Shea believes strongly that MOOCs can play an important role in widening access and participation. The Edinburgh MOOCs have already made an important contribution to widening access by reaching into schools that the university would otherwise not have access to, enabling students to get a taste of the kind of learning experience the University of Edinburgh has to offer. O’Shea concluded by highlighting the unexpected popularity of the Introduction to Philosophy MOOC which has been particularly successful in this regard; enabling large numbers of pre-entry students to find out what philosophy is all about, and leading to the creation of new masters level programmes. Typical. 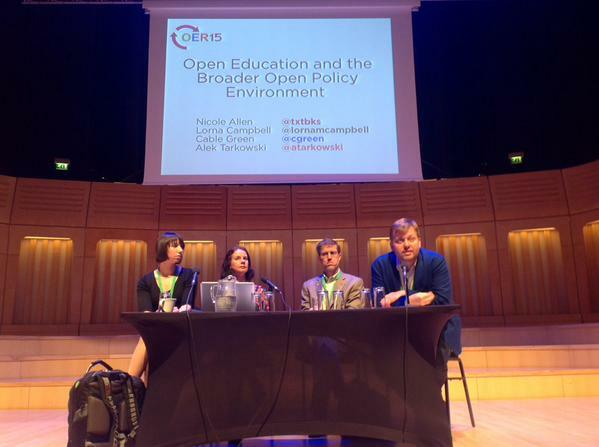 You wait a week for an #OER15 blog post and then two come along at once! Thanks to the folks at CADARN for this inspiring little video which really captures the spirit of the conference. Featuring, among others, David Kernohan, Cable Green, Hayden Blackey, Josie Fraser and me. I was delighted to be able to join a panel session with Cable immediately after his keynote, alongside fellow Open Policy Network colleagues Nicole Allen of SPARC and Alek Tarkowski of Centrum Cyfrowe Poland, discussing open education and the broader policy environment. Picking up on the themes he’d introduced in his keynote, Cable highlighted the importance of providing support to move from policy to implementation, Alek highlighted the work of the Polish open e-textbooks program and Nicole discussed what we can learn from the success of Open Access advocacy. I particularly liked Nicole’s point that while policy plays an important role in promoting open education, it is not hugely effective in engaging students in OER; the involvement of the library can be much more important here. Nicole Allen, Lorna M Campbell, Cable Green, Alek Tarkowski. Picture by Simon Horrocks. In terms of the Scottish Open Education Declaration, there would be huge value in evidencing the points of the declaration with examples of practice from across the sector, and judging by the number of colleagues who presented from Scottish institutions, there is certainly plenty of practice going on. I’m hoping to (eventually!) 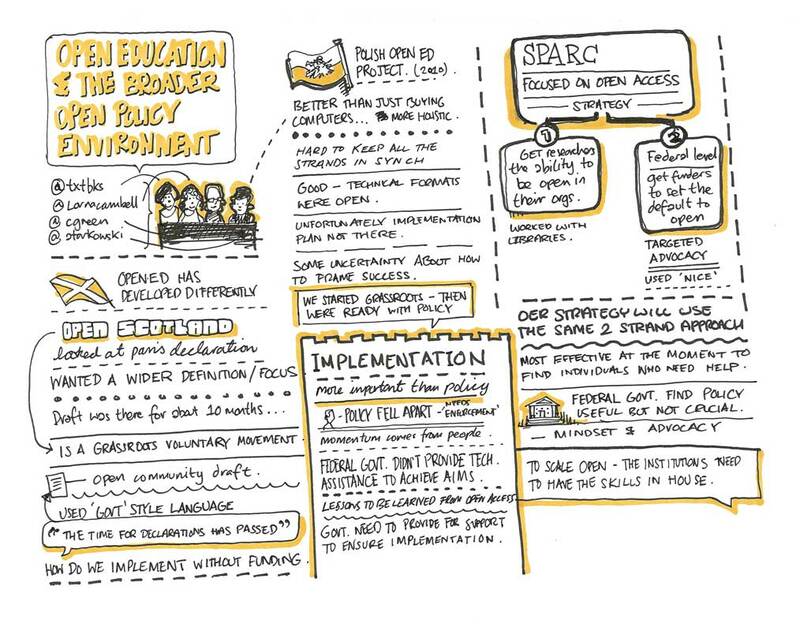 blog an overview of Scottish colleagues’ contribution to the conference over at Open Scotland, along with my slides from, Common Ground, a short paper I presented on open education initiatives across all sectors of Scottish education. This was the first time I’d heard Brian Lamb talk and he was every bit as engaging and thought provoking as you might expect. Brian suggested that when it comes to embracing the open web scalability, sustainability and institutional wide impact are still an issue. One solution to this problem is that we need to build “training wheels for the open web” to help colleagues who struggle. Two initiatives that do just that are Domain of One’s Own, which provides web space to encourage colleagues at University Mary Washington to explore the creation and development of their own digital identities, and the fabulously named SPLOT! which aims to make it easy to post activity to the open web without creating accounts, or providing personal information. One important point I learned from Brian’s presentation is that all cool developments happen over drinks 🙂 Oh and he also highlighted the excellent development work of Pat Lockley which gets him extra points in my book. The theme of this years conference was Mainstreaming Open Education, and while I think we all agree that we do want to see open education as an integral component of mainstream education I confess to being slightly uneasy that we run the risk of neglecting the experience of many colleagues for whom open education practice is increasingly being pushed to the margins as a result of budget cuts, redundancy and the casualisation of teaching contracts. Josie Fraser touched on these themes in her brilliant keynote about Leicester City Council‘s policy giving permission to school staff to openly licence the educational resources they create in the course of their work. Josie acknowledged that the mainstream can be a very normative and exclusionary place, synonymous with privilege, and tokenising rather than embracing, however it can also recognise diversity and value difference. Digital literacy is key to engaging people so they can critically challenge their online environments. 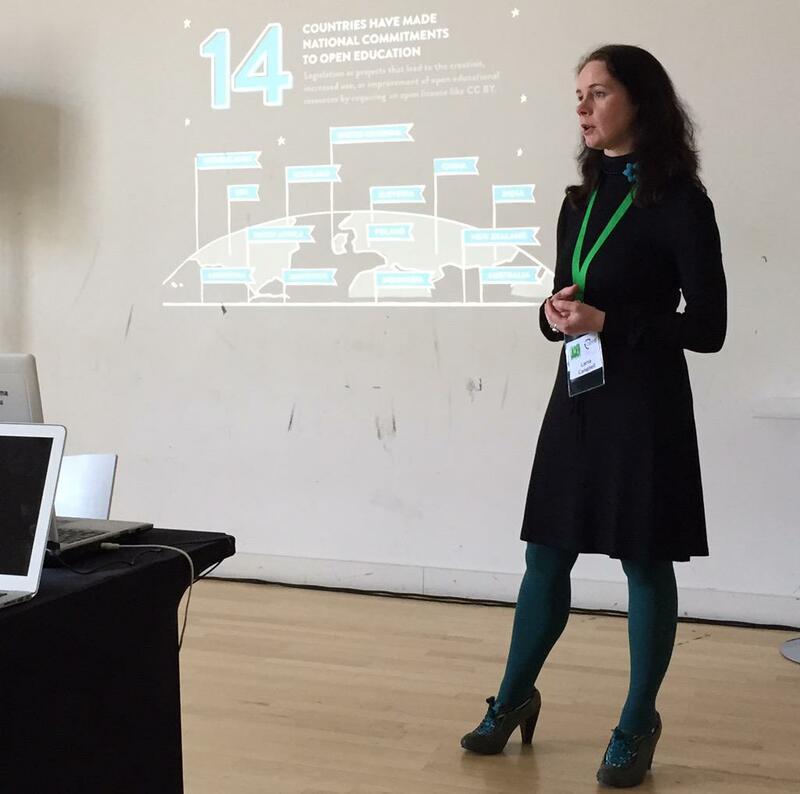 What really inspires me about Josie’s work with Leicester City Council, it that it provides an excellent example of how open education policy really can support transformative practice. If you haven’t already listened to Josie’s keynote, I can highly recommend it. It’s worth an hour of anyone’s time. Unless you’re a dolphin lover. I’ve been a huge fan of BL Labs projects for a while now, particularly the wonderful Mechanical Curator, which provides undirected and unpredictable engagement with digital content by posting random small book illustrations from the library’s digital collections on an hourly basis. (You can learn more about the inner workings of the Mechanical Curator here: Peeking behind the curtain). Bob Nicholson’s (@digivictorian) marvellous Victorian Meme Machine is another favourite. 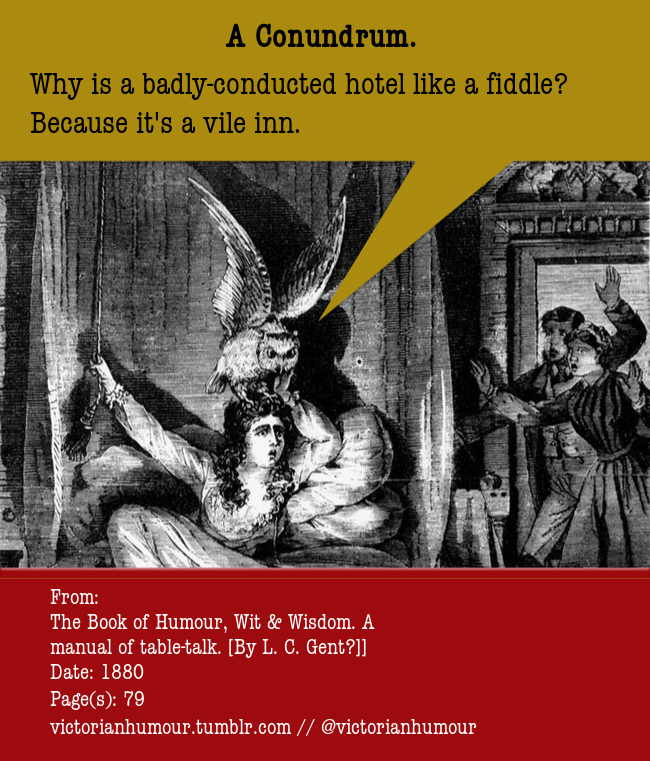 This highly creative and entertaining project uncovers forgotten Victorian jokes preserved “largely by accident” among the library’s digital collections and brings them back to life. Not to be outdone by the Mechanical Curator, the Victorian Meme Machine has recently launched the Mechanical Comedian, which tweets random Victorian jokes every lunchtime. On the one hand these projects might appear frivolous and light-hearted but they are a compelling demonstration of what is possible when you bring creative thinkers together with innovative technology and open content. 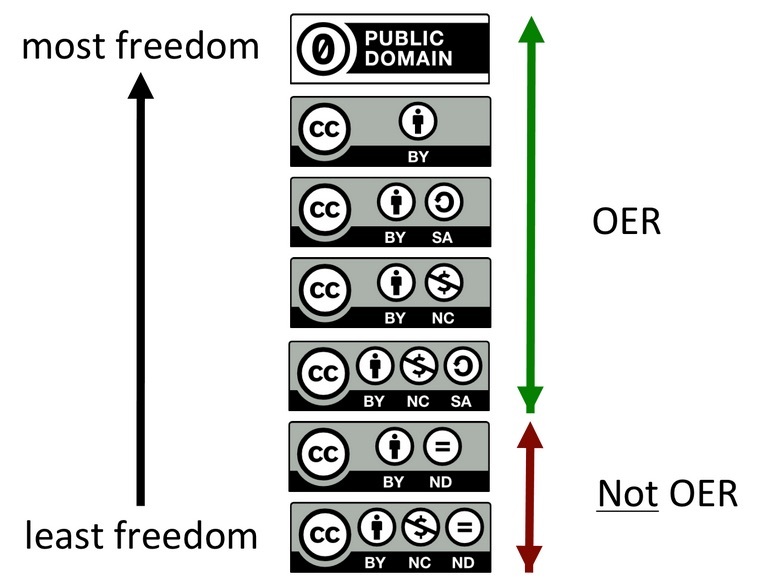 I’ve been thinking a lot about the interface between openness, creativity, and content recently in the context of teaching and learning and I think there is a lot that open education could learn from the creative approaches to content discovery and reuse being explored by the BL Labs projects. One of the things I love about open education in general, and open educational resources in particular, is the creative potential they offer to find, use, reuse, create and recreate such a wealth of diverse content and resources. However it appears that, in some quarters at least, open educational resources seem to be regarded as a rather restricted class of content that must be managed and used in a particular way. OER still seems to be rather tainted with some of the negative and rather questionable ideas associated with reusable learning objects. This makes me rather sad as, to my mind, this perception seems to be contrary to what open education should really be about and neglects the creative, fun, and serendipitous aspects of openness. That’s not to say that there aren’t some great examples of creative approaches to surfacing open education content out there. 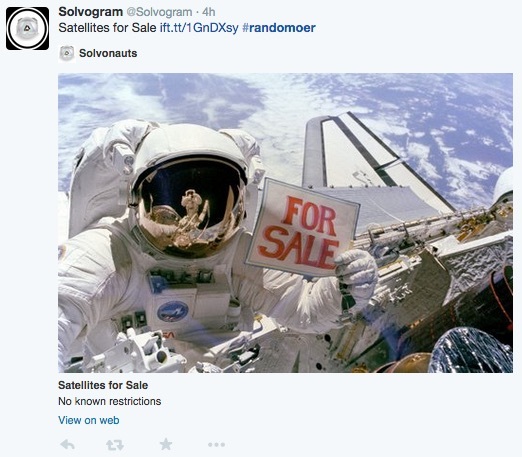 As well as presenting a simple search interface to open educational resources aggregated from a wide range of repositories worldwide, Solvonauts tweets #randomoer every hour. And I also love OpenSpires simple interface to the University of Oxford’s eclectic collection of open content and resources.